2. Katie's voice!! Did you hear it. It's completely different. Hey, I can relate, all women sound a little more manly at 7am than they do at 7pm, but geez... she sounded like a completely different person. 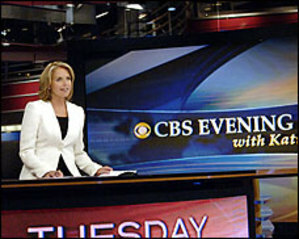 More feminine, which she and CBS obviously aren't afraid of... and I think that's cool. 3. A white blazer -- the day after Labor Day?!? Just kidding. I think it's just funny how many people will write/blog/talk about this today just because she's Katie Couric. America is obsessed with her hair/legs/clothing choices/shoes. It's a strange back-handed compliment I guess. side note: apparently a lot of people took the order because I have a friend who couldn't watch the newscast online because so many people were on at once! That's all for now... since Katie doesn't have a concrete way to sign off her broadcast, I don't feel a need to have something consistent either. But don't worry... I won't ask you to go to my website and make suggestions.